Weighted Decomposition in High-Performance Lattice-Boltzmann Simulations: Are Some Lattice Sites More Equal than Others? 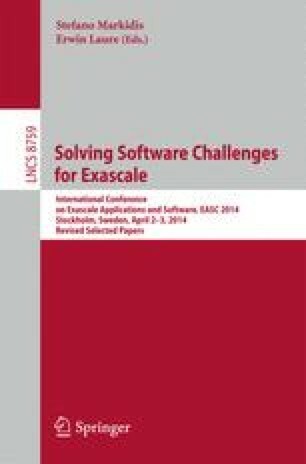 Obtaining a good load balance is a significant challenge in scaling up lattice-Boltzmann simulations of realistic sparse problems to the exascale. Here we analyze the effect of weighted decomposition on the performance of the HemeLB lattice-Boltzmann simulation environment, when applied to sparse domains. Prior to domain decomposition, we assign wall and in/outlet sites with increased weights which reflect their increased computational cost. We combine our weighted decomposition with a second optimization, which is to sort the lattice sites according to a space filling curve. We tested these strategies on a sparse bifurcation and very sparse aneurysm geometry, and find that using weights reduces calculation load imbalance by up to 85 %, although the overall communication overhead is higher than some of our runs. We thank Timm Krueger for his valuable input. This work has received funding from the CRESTA and MAPPER projects within the EC-FP7 (ICT-2011.9.13) under Grant Agreements nos. 287703 and 261507, and from EPSRC Grants EP/I017909/1 (www.2020science.net) and EP/I034602/1. This work made use of the HECToR supercomputer at EPCC in Edinburgh, funded by the Office of Science and Technology through EPSRC’s High End Computing Programme.